Asking powerful questions is part of my everyday life. I use these as part of my consulting and coaching profession, my advising role, and in running my own business. The right question asked at the right time can lead to surprising insights and help us move forward. Some questions can be asked as thought exercises only while others require thorough written attention. Either way, the first step is to ask. I urge you to give each question a try and keep them handy for when you face obstacles. For anyone who expends precious energy worrying about future situations, this is indeed a compelling question. With it, you can uncover unrealistic expectations and biases that can stop you from achieving and enjoying your success. This one-two punch of powerful questions will help you eliminate unnecessary angst and help you put your energy into the right things. Did this question get you thinking? Get more in this book I wrote for you! 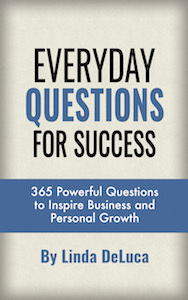 It has 365+ powerful questions to help you grow yourself and your business. It’s a great way to get unstuck!